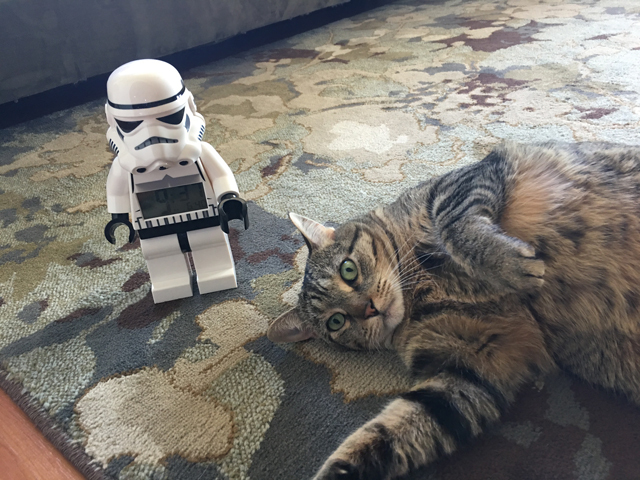 Not only is today Star Wars Day, given the pun-ish term “May The 4th Be With You” each year on May 4th, but today also we celebrate 3 years since Tabby came to be with us. I blogged about her introduction here. As you can see from the first photos to the most recent one above, she’s put on some weight. I guess that would determine she’s getting fed well. Tabby has been the sweetest cat and has grown more loving each and every year she’s been a part of our family. I’m hoping for many more years of her being with us. She’s a very healthy cat and with very few exceptions, is a joy to spend time with and hang out with. Aww, happy three to Tabby!!!! What a wonderful adoption date! When I first saw this, I thought, “that’s the smallest damn cat I’ve ever seen.” Then I realized that’s a LEGO minifigure clock. Oy. I now see that perception and view.